Facts about Entomophagy, Entomophagy is the consumption of insects by human beings. Entomophagy has been practiced before humans had tools to hunt or farm. In Shanxi ruins in China, silkworm cocoons were found with large holes suggesting that the pupae were removed to be eaten. In Spain paintings dating from 30,000-9,000 BCE show the collection of wild bees nests. Even today entomophagy is still accepted in 80% of the world, these areas include Latin America, Africa, and Asia. 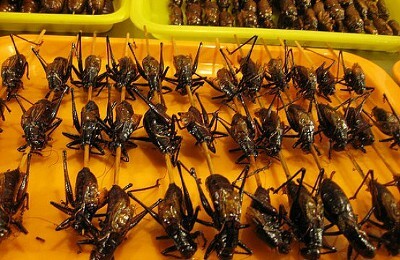 Eating insects in not a common practice in Europe and the United States and is even consider taboo. The most popular insect varieties eaten around the word include crickets, cicadas, grasshoppers, ants, beetle larva and caterpillars. Insects are an inexpensive way to get protein in your diet compared to the high cost of meat. As the population of humans increase experts believe that humans will have no choice but to eat bugs. Insects do not need as much land compared to livestock. They also do not need as much feed because they are cold-blooded. Insects consume less water and do not create much waste. Although it is taboo, everyone already eats some amount of insects. The average person can consume almost a pound of insects per year which is mixed into everyday foods. Also some food dye contain insect products.